One of my favorite Shakespeare bloggers is Mya Gosling and this week she created a really fun Shakespeare board game on her site. First one to die wins. A portion of it is pictured below but you can get the whole image on her website at GoodTickleBrain.com (and you really should go take a look at her Shakespeare comics – they’re fantastic). 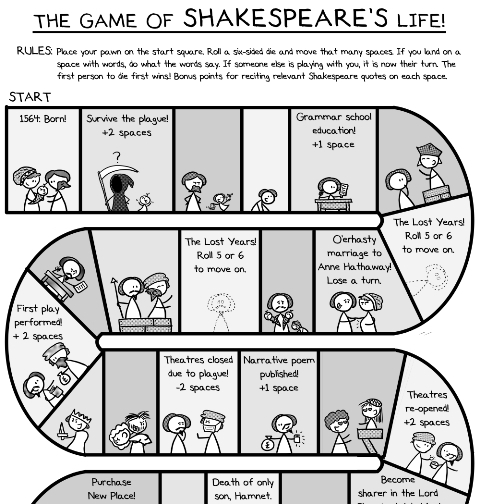 So in honor of the 400th anniversary of William Shakespeare’s death tomorrow (and also his birthday) have fun playing The Game of Shakespeare’s Life! Shakespeare nerds should ace reciting the quotes…and if you’re prone to turning things like this into a drinking game…there’s always that. I haven’t posted a Friday Funny in a while but this one came across my desk and there’s nothing like a good classic. In honor of Shakespeare’s most tragic love story, here is a little pre-show weekend fun: Popeye the Sailor, Olive Oyl, and Bluto in Shakespearian Spinach Epidosde # 76 (January 19, 1940). If only Juliet had had some spinach! Have a great weekend. Go see some Shakespeare! A little something to launch your weekend. English folk singer Laura Marling is writing music for the Royal Shakespeare Company’s upcoming production of As You Like It, which opens April 12. This new song is featured in Act II, scene 5 and plays over the revelry of the forest in the trailer like a haunting sigh. We can’t stop listening to it. You may have to click on the YouTube links below to watch the videos if they don’t open here. Happy Friday all. Barry Edelstein has been appointed the new artistic director of The Old Globe in San Diego. A nationally-recognized director, producer, author and educator, Edelstein will work together with managing director Michael G. Murphy to lead San Diego’s flagship arts institution. Currently the director of The Public Theater’s Shakespeare Initiative in New York City, Edelstein will assume the artistic directorship of The Old Globe on Nov. 1 and will reside full-time in San Diego in January 2013. Edelstein is widely recognized as one of the leading authorities on the works of William Shakespeare in the United States, having directed nearly half of the Bard’s works. He is the author of Bardisms: Shakespeare for All Occasions and Thinking Shakespeare, which New York magazine called “a must-read for actors” and is now considered the standard text on American Shakespearean acting. As director of the Shakespeare Initiative at The Public Theater, he oversees all of the company’s Shakespearean productions, as well as The Public’s extensive educational, community outreach and artist-training programs. He was associate producer of The Public’s recent Broadway production of The Merchant of Venice starring Al Pacino. Amaluna invites the audience to a mysterious island governed by Goddesses and guided by the cycles of the moon. Their queen, Prospera, directs her daughter’s coming-of-age ceremony in a rite that honours femininity, renewal, rebirth and balance which marks the passing of these insights and values from one generation to the next. In the wake of a storm caused by Prospera, a group of young men lands on the island, triggering an epic, emotional story of love between Prospera’s daughter and a brave young suitor. But theirs is a love that will be put to the test. The couple must face numerous demanding trials and overcome daunting setbacks before they can achieve mutual trust, faith and harmony. Amaluna is currently playing in Toronto and is scheduled to tour Vancouver, Seattle, and Edmonton. Click Here for tickets and information. The Friday Funny: A Lighthearted Midsummer Inspiration Mayhaps? Meet Billy and his pet pig, Francis, as they seek play-writing inspiration. Enjoy a lighthearted weekend and go see one of the terrific productions of A Midsummer Night’s Dream playing this summer.